Pioneers in the industry, we offer ptfe coated fiberglass conveyor belts, heat resistant conveyor belt and ptfe conveyers belt from India. Manufactured in compliance with the industrial standards, the quality of this PTFE Coated Fiberglass Conveyor Belts is always maintained. Offered to clients at a very reasonable price, this product is highly asked for in the market. Its resistance to chemical and temperature is quite praised in the market. In addition, we also provide safe and timely delivery of this quality product. 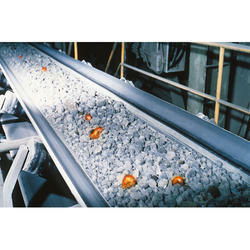 We are successfully ranked amongst the topnotch entity offering a wide range of Heat Resistant Conveyor Belt. We are instrumental in the manufacturing, exporting and wholesaling of high quality PTFE Conveyers Belt. 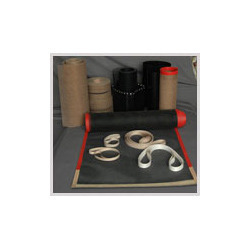 These conveyor belts are manufactured under the strict supervision of expert team in accordance with industry laid parameters using quality assured raw materials. Due to their excellent release properties, high dielectric strength, wear and flexing resistance and high chemical resistance, these conveyor belts are globally demanded by our clients. Energy Savings PTFE/Glass Belts prove better heat transfer and absorb less energy. Maintenance Costs PTFE/Glass Belts have non-stick surface and are easy to clean. 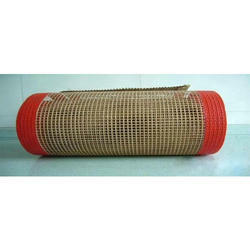 Bullnose joint:Made of specially woven open weave mesh from kevlar thread. This extremely strong seam is then stitched to the belts ends, resulting in an open weave mesh seam that does not block airflow. Alligator joint:Exceptionally strong splice is constructed with metal alligator lacing through which a pin is placed to complete the splice. Edge reinforcement: “shiva” offers a wide range of edge reinforcements for belts in order to protect the belt edges from wear, abrasion and snagging. The reinforcements strengthen the sides and support guide strips, dots and other guiding & tracking devices.